Awards to Consist of $2400 for Four Years at U. of W.
Joseph E. Davies, during his visit to Watertown yesterday afternoon, formally announced high school scholarships which he will offer to graduates of the Watertown High School, his alma mater. He proposed the scholarships some months ago, and while in the city yesterday completed arrangements with school officials. He went over the details with Roger Holtz, superintendent of schools, and two members of a local committee which he had named some time ago. The committee members present were Max Rohr and John D. Clifford. The third member of the committee, Attorney William H. Woodard, was unable to be present. Under the plan, a JOE DAVIES SCHOLARSHIP will be offered to an outstanding high school graduate for four years. The scholarship will consist of $600 for each of the four years — $2,400 in all to the graduate selected. The scholarship will be for the University of Wisconsin, where Mr. Davies received his law degree. One scholarship will be awarded each year for a four year period. Some of the details of the scholarship still are to be worked out by school officials and Mr. Davies. When Mr. Davies first indicated some months ago that he was planning to offer scholarships to high school graduates, he outlined in a general way the qualifications he desired to see included in the criteria. School officials, following Mr. Davies' broad plan, have prepared a, detailed plan, and yesterday Mr. Holtz turned this over to Mr. Davies for his consideration. In behalf of the school, Mr. Holtz yesterday expressed his deep gratitude to Mr. Davies for his generosity and told him that a "good many boys and girls are going to receive a university education because of your kindness and generosity." Mr. Davies told Mr. Holtz and the committee that the Watertown High School was very dear to him, and credited the high school, as well as the University of Wisconsin, with having played a major part in his success. Mr. Davies graduated from the local high school in 1893 as valedictorian of his class. Two senior girls were awarded Joe Davies scholarships this morning at the annual Awards Day program held at the high school gymnasium. Also, a number of other major scholarships were awarded plus a number of other awards. The two Davies’ scholarship recipients are Mary Kathryn Theder, daughter of Mr. and Mrs. Gay Theder, 212 South Monroe Street; and Nancy Sue Winkenwerder, 210 South Eighth Street, daughter of Harold Winkenwerder, Madison. Graduating seniors shared in well over $100,000 in scholarships at Thursday evening’s annual awards program in the auditorium of Watertown Senior High School. . . . Six seniors were presented with the Joseph E. Davies scholarships, each valued at $6,800. The six recipients were Jonathan Fullmer, Connie Gudenkauf, Michelle Novotny, Janice Stendel, Randall Tietz and Peter Miller. Kuzmeski succeeds Joseph E. Davies of Washington, D.C., as president. Davies will continue to serve as a trustee of the foundation. Kuzmeski was also elected to the membership of the foundation. She also succeeds Davies at that position. Membership of the foundation is similar to stockholders in a public corporation. Along with Kuzmeski, serving as members are James Clifford of Lake Mills, Robert Bender of Watertown, David Veldhuizen of Minoqua and Lawrence Beebe of Bethesda, Md. Kuzmeski is the daughter of James and Patricia Clifford of Lake Mills. She is a third generation member of the Clifford family to be deeply involved in the Davies foundation. She has been a trustee of the board since 2004 and with Friday's election, has become president and now also holds membership. Her brother, Kevin Clifford, serves as agent for the foundation. He also serves as vice president and a trustee of the foundation. Kuzmeski's father, James Clifford, has served on the board in various capacities for decades. He currently serves on the membership and as a trustee. It was Kuzmeski's grandfather, the late John D. Clifford, for over half a century was editor and publisher of the Watertown Daily Times, who initially worked with the late Joseph Davies in the formation of the scholarship foundation back in 1952. The first scholarships were awarded in 1954. He served on the foundation board and as the agent at its founding and continued in those capacities for several decades. The Joseph E. Davies Scholarship Foundation governing bodies made several changes to various boards at the annual meeting in Watertown this week. Pam Streich, superintendent of schools for the Lake Mills School District and a Davies scholar, was elected a trustee of the foundation. She succeeds David Veldhuizen of Minoqua who tendered his resignation as a trustee. Trustees re-elected at the meeting were Pat Caine, Kevin Clifford and John David of Watertown, James Clifford of Lake Mills, Chris Haeger of Cudahy, William Schultz of Lodi, James Bender of Lake Mills, Maribeth Clifford Kuzmeski of Grays-lake, Illinois, Donna Pitterle of Kenosha, Dihane D. Grosjean of New York City, New York and Lawrence Beebe and Brent Beebe of Bethesda, Maryland. Members of the foundation were elected at the meeting. Members are similar to shareholders in a private corporation. Elected to membership were Maribeth Clifford Kuzmeski, of Grays Lake, Illinois, Kevin Clifford of Watertown, James Bender of Lake Mills, Lawrence Beebe of Bethesda, Maryland. Trustees of the foundation elected officers. Elected were Maribeth Kuzmeski, president; Kevin Clifford, vice president; Lawrence Beebe, vice president and treasurer; Brent Beebe, assistant treasurer; and James Bender, secretary. The officers also selected Kevin Clifford to continue in his duties as agent for the foundation. The board decided the Davies scholarships would continue to be funded at $20,000 per award. This year one student from Watertown, Jefferson and Dodgeland High School will receive the Davies awards. Watertown High School is awarded a scholarship each year and other schools receive a Davies on a rotating basis. Andy Wallman of Cambridge and a former Watertown resident, has been elected a new trustee of the Joseph E. Davies Scholarship foundation. His election came at the foundation’s annual meeting this month. Wallman’s trustee position is an expansion of the number of trustees. Wallman is the son of Chee Chee Wallman of Watertown and the late Charles Wallman. Charles for many years served as a member of the Davies foundation board. All other trustees of the foundation were re-elected at the annual meeting. They are Pat Caine, Kevin Clifford and John David of Watertown, James Clifford of Lake Mills, Chris Haeger of Cudahy, William Schultz of Lodi, James Bender of Lake Mills, Maribeth Clifford Kuzmeski of Grayslake, Illinois, Donna Pitterle of Kenosha, Dihane D. Grosjean of New York City, New York and Lawrence Beebe and Brent Beebe of Bethesda, Maryland. Members of the foundation were elected at the meeting. Members are similar to shareholders in a private corporation. Elected to membership were Maribeth Clifford Kuzmeski, Kevin Clifford, James Bender, Lawrence Beebe. Trustees of the foundation elected officers. Elected were Maribeth Clifford Kuzmeski, president; Kevin Clifford, vice president; Lawrence Beebe, vice president and treasurer; Brent Beebe, assistant treasurer; and James Bender, secretary. The officers also selected Kevin Clifford to continue in his duties as agent for the foundation. The board voted to continue the Davies scholarships at $20,000 per award. This year one student from Watertown, Fort Atkinson and Dodgeland high schools received the Davies awards. The Joseph E. Davies Foundation was established in 1952 by the late Joseph E. Davies and the first scholarships were awarded two years later. 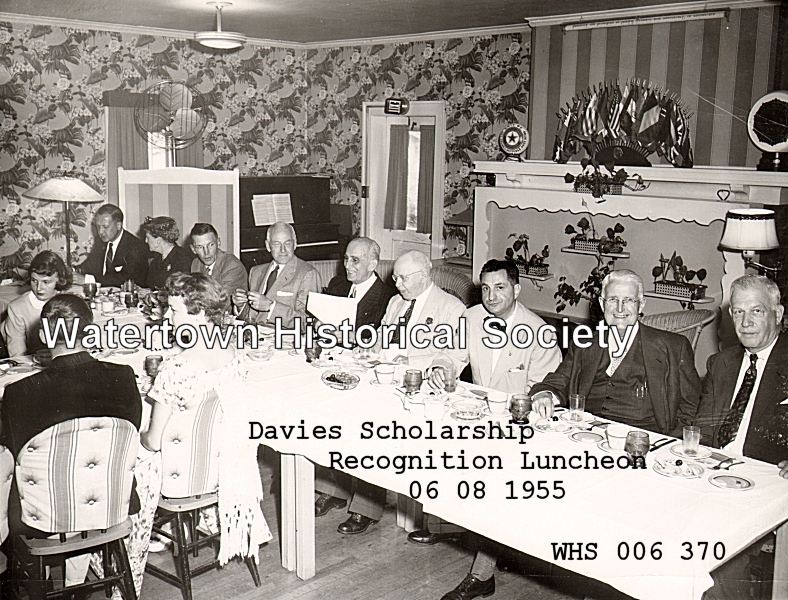 Davies attended the early scholarship programs in Watertown and personally presented several of the awards.